Over the last decade social media has revolutionised our work, education, personal relationships, and even activism. Particularly, Facebook and Twitter have become more than just tools for communication, but fundamental to our lives. Is this a change we should celebrate, or despair of? Is it good that we can support new causes with the click of a button, or does it make us complacent? 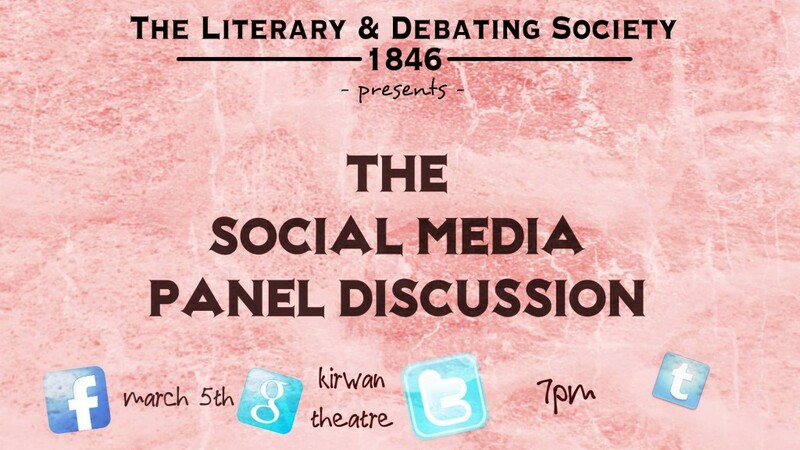 These questions and more will be answered this Thursday, March 5th, when the Literary and Debating Society are hosting a panel discussion on Social Media – with speakers from all four corners of the world! Despite this, they have some incredible speakers, regardless of where they’re from. Among these will be Suey Park. Suey Park is a Twitter activist with an unstoppable voice – having made a name for herself in the world of intersectional-feminism, she moved on to bigger and better things; namely Stephen Colbert. She is probably best known for having started the twitter phenomenon “#CancelColbert” following a comment made by Colbert on his long-standing TV Show, The Colbert Report. Ms. Fiona Kennedy, a journalist and blogger at Sunny Spells and Scattered Showers and an Ambassador at See Change, a national mental health campaign, who will be talking about social media’s effect on mental health. Make sure to come along to the Kirwan Theatre this Thursday March 5th, to hear the panel discuss their views on social media and answer your questions during the Q&A.